Keeping your grass green, lush, and healthy isn’t exactly rocket science, but there is some legitimate science that goes into the process of lawn care. You may be familiar with nitrogen’s key role in fertilizer, but what else is there to know about keeping your lawn healthy for seasons to come? 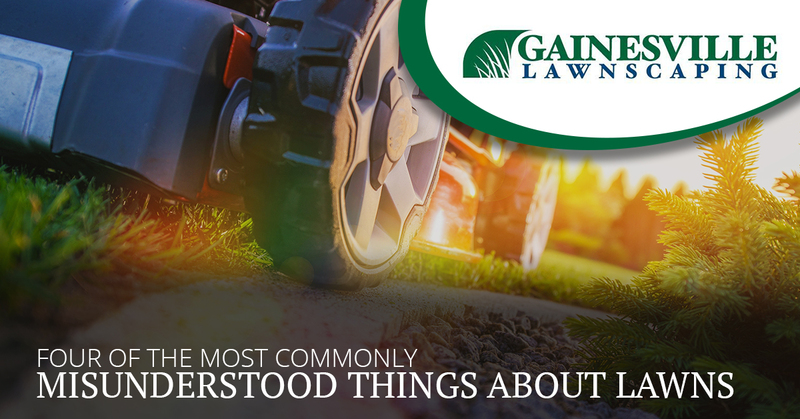 Gainesville Lawnscaping, your commercial lawn care company in Gainesville, Newberry, Jonesville, and other surrounding areas of central Florida, thought we’d address the matter by focusing on what’s not true about lawn care. Questions as you read below? Don’t hesitate to contact Gainesville’s premier landscaping company at any point. Though it would make sense, you shouldn’t necessarily water your grass every single day. Watering a little bit every day isn’t bad for your lawn, per se, but it can encourage weed growth and leave your grass with a relatively shallow root system. Infrequent yet deep watering — enough to saturate the soil a good 6 to 8 inches — is the way go, roughly two or three days a week. On the contrary, the more blade length you leave, the longer it will take for grass to reach the length that it was before you mowed. Overly short grass may look nice (like golf course grass), but it’s actually more susceptible to weed infestations, overwatering, and other lawn threats. So, the next time your grass starts to look like it’s a hippie, don’t freak out! If your yard trimmings are protruding onto the sidewalk or a neighbor’s property, or the trimmings consist of more than just grass, then yes, we recommend picking it up and composting it accordingly. However, if there are a few trimmings on your lawn, we recommend leaving them there! It may look a little funky at first, but clippings are healthy for your lawn as they’ll account for roughly 25 percent of the natural fertilization of your grass. Enjoy one less step when taking care of your grass and a natural ongoing fertilizer in the process. Then again, our landscapers in Gainesville will just take care of the job for you. You can attempt to aerate your lawn with this method, but it’s not going to be very effective…at all. While this idea sounds aerate-tight, the spikes on your shoes just aren’t going to get deep enough into your grass. This is a service that’s best left to the pros like us, and besides, there are better ways to multitask. Rest Easy And Let Gainesville’s Best Landscaping Company Take Care Of The Work! We get it: you care about how your yard looks, and the HOA cares even more. That’s why our yard care experts are here to help do the job for you. Get to get started? From commercial recurring lawn care to residential design, Gainesville Lawnscaping is here for you.